I will follow their recipes as they seem to be somewhat similar. There are two ingredients I will change, the first I will be using Potassium nitrate (Saltpeter) instead of 'burnt tartar' which is sometimes also used with Saltpeter and sometimes just Tartar alone (Valentine). If anyone has experience with using both or either of these substances in the refining please let me know and I may consider it. Secondly, I have also omitted the 'small iron nails' as some authors suggest and replacing it with iron filings (which some authors suggest using also), primarily because this iron has to be heated up to a high temperature and I feel it will be easier to reach this if the filings are small, and partly because it's not as easy as it sounds to find small truly iron nails. There are lots of steel coated nails around but specific pure iron nails were not easy to find in my area so I opted for the filings instead. I hope it will also create a better star in the end and a finer scoria/feces. - 1oz Saltpetre + additional 1oz spoonfuls during each refining. * Depending on how much Stibnite I can separate from the matrix (looks like Calcite) I will have to alter the weight but I will keep that ratio as it seems to be the important ratio that all authors use. I plan on doing 5 full refining sessions. Hopefully this will give the star as promised. I found this has been performed by the 'Chymistry of Isaac Newton' website but I am so far not impressed with the pattern of their star, I don't believe its been refined enough or properly as the geometric patterns should line up evenly. I hope I can create something superior. If anyone else has created the Star Regulus of Antimony here please share your stories, tips, & photos of your results (or link to where it is on this forum as I couldn't find anymore experiences created this through the search). Please also have some patience. I am waiting on a few things still but I thought I would get this topic going to see what others have to share for feedback. I think I may order some more Stibnite as well, just in case I royally screw up the initial batch. If anyone knows a better source for Stibnite than Ebay please let me know as well! Wish me luck! Using iron or steel will lead to the exact same results. Regular steels are just iron alloyed with varying small amounts of carbon. All commercial irons and steels contain small amounts of substances like carbon, silicon, phosphorus, etc. In order to get pure iron you need to purchase it from a chemical supplier. The alchemists and chymists worked with irons and steels of commercial grade, as made by the metallurgical industry of their times. They did not work with truly pure iron (which is made through electrolytic methods that were unknown to the people of those times.) 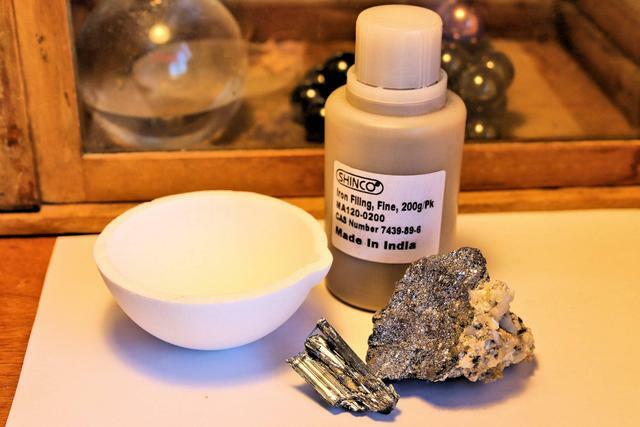 When you reduce the stibnite, the iron/steel will be turned into iron sulfides, and these traces of other substances in it will be basically "burned" up, or volatilized, or turned into other compounds. It won't make any difference whatsoever in the end. Iron and steel will serve the exact same purpose in this operation: reduce the antimony from its sulfide. A propane or MAPP gas torch simply won't give you enough heat output to carry out this operation on the scale that you are planning. You need to contain the heat and make it surround and reverberate on the whole body of the crucible. It needs to be glowing hot. So, you will need a furnace. Or at least you will have to improvise a furnace. The problem with the steel nails I was finding were they were all galvanized or coated in something, which is why I just went for the iron filings instead which seemed a more simple solution. As far as heat containment, yes you are correct, I know that direct heat will not be enough for the process which is why I will build a furnace around the crucible to prevent the heat from escaping - as the crucible being 'red hot' is an important part stated in all the texts. I was tempted to buy one but I think a makeshift one will be sufficient. Thank you for clarifying the appropriate crucible for this project. I couldn't precisely figure out which crucible would be the best for this application and what you showed is exactly what I thought I would need. I really appreciate your input. From what I have read from your posts, you have a fairly intimate knowledge of quite a selection of Alchemical texts, do you think the authors I have selected are sufficient for what I would require to know for this experiment? Are there any more you would recommend? Have you performed this work yourself? The problem with the steel nails I was finding were they were all galvanized or coated in something, which is why I just went for the iron filings instead which seemed a more simple solution. As far as heat containment, yes you are correct, I know that direct heat will not be enough for the process which is why I will build a furnace around the crucible to prevent the heat from escaping - as the crucible being 'red hot' is an important part stated in all the texts. I was tempted to buy one but I think a makeshift one will be sufficient. From what I have read from your posts, you have a fairly intimate knowledge of quite a selection of Alchemical texts, do you think the authors I have selected are sufficient for what I would require to know for this experiment? Are there any more you would recommend? I think you got enough info from those authors to perform the basic operations. You might also want to read what Stahl and Becher say on the subject, though. Consult Stahl's Philosophical Principles of Universal Chemistry, the several sections dealing with antimony regulus. These two chymists make a series of curious transmutational claims regarding both the "regulus" as well as the "slags" obtained from these operations. Have you performed this work yourself? Last edited by JDP; 11-08-2018 at 05:58 AM. If you want to work with small quantities you probably don't need a furnace. 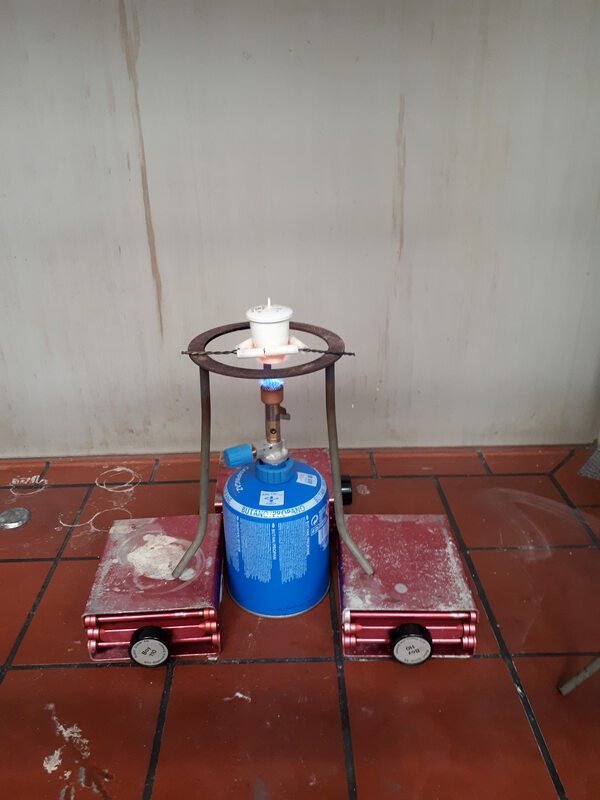 I got pretty good red hot results in using this kind of torch/crucible/triangle combination wheras a common wire mesh really couldn't provide the necessary heat. Using heat resistant gloves is a good idea, but be prepared that it could be difficult to hold a tong with them. Especially when you want to react quickly. That has been my experience too that the cooling is critical to the star formation. I I needed to get my cast iron dish hot too in order to cool more slowly and get some crystallization markings. I have not gotten a perfect star pattern but definite crystallization markings that sort of look like a star. One interesting thing I did see one time is after several purifications with nitre that the molten regulus was white rather than black after being poured out to cool down. I interpreted that as the regulus has been purified and ready for the next step. The PON course mentions three purifications should be enough for the regulus and that is what I have found too. I bought some crucibles and firebricks from a pottery supply store and use a propane weed burner to get the crucible glowing hot as JDP says above. Flooring nails, the one type of nail I didn't search for! Thank you, maybe I will try an experiment with both the filings and small nails to see if it will make a difference. I feel that the sulfur will stick & fuse to the filings easier but that could be an incorrect assumption. Excellent suggestion for Stahl & Becher as well. Stahl has written a very hefty section on it (actually multiple on Antimony in general) so that should really help - I shall begin reading. As for the creation of a perfect star, yes I am aware it's probably a vain pursuit but I have read statements that it has come into perfect angular alignment in order to create this star in the form of the six pointed star of David shape, so it's more of a challenge. We'll see how it goes, either way I'll keep my fingers crossed. An issue I think I may have is the cooling down process, as this is winter here I will have to perform this outdoors, I am wondering if the 0C weather will help or hinder the cooling down process? It seems that in order to form the crystalline structure its recommended to slowly cool down the Regulus from what I have read (in fact a lot of crystal forming structures need slow cooling processes). Hopefully it wont make a difference, at least a negative one. I saw your set up in your Antimony thread, which is initially what I was going to do but then JDP made the suggestion and because of the outside temp right now I think Catmandu's suggestion of the fire bricks would probably be the easiest and most efficient option. I think I will use your set up when it gets a bit warmer in summer for other experiments. Excellent suggestion for the firebricks, great minds think alike. That was my first though for what I could do. The second would be a makeshift paint can with outside insulation. But to be honest I think firebricks is probably the best option. I would like to ask you and JDP what form of dish/pot did you pour your Regulus into after the crucible? Does it matter? I see most use Iron and some greased. Do you grease it? Does it help? Thank you all for your great suggestions. You have to grease the inner side of the metal molds where you pour molten metals/metalloids in. Otherwise they will become attached to the surface and it will be bothersome to detach them. Others persisted in the martial regulus of antimony delusion, blinded by the outwardly formed star and forgetting the inner, negatively entropic one. I found a cast iron mini muffin holder to pour into. A cast iron ladle to pour into would work too. I didn't need to grease it at all. either one gives some depth to help break off the scoria.